Apparently, Mikel Arteta challenged Owen pretty bad, and Owen reacted by punching Arteta softly on his upper back. 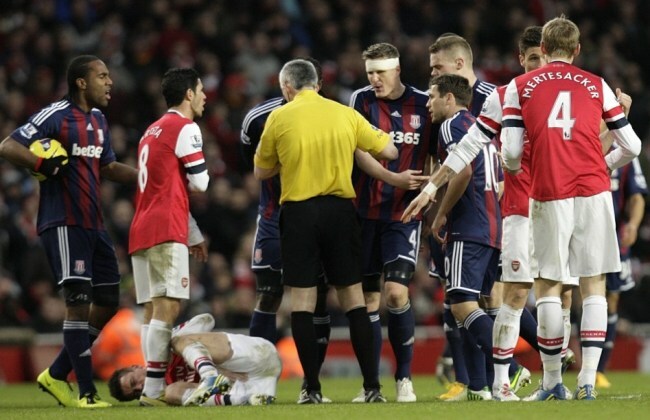 When Arteta attempted to get back at Owen, his Arsenal buddy Jack Wilshere came and pushed Owen himself. Teamwork at its best, eh? Wilshere takes matters into his own hands. This means that Owen has officially gone unpunished. In his defense, Arteta’s tackle was kinda hard, wasn’t it? Save your fist pumping for the club, Owen! Coincidentally, I hurt my back at the gym this morning. I can say that I “feel” Arteta’s pain. ← Steven Gerrard Steals the Spotlight…Again!